Starting a six-week diet that contains just 1,200 calories a day will help you lose weight. It's important, however, to choose menus that provide adequate nutrients through a balance of grains, fruits, vegetables, lean protein and dairy products or other calcium-rich foods. A 1,200-calorie diet may not be appropriate for men, athletes, pregnant or nursing women, or people with chronic medical problems. Do not begin any weight-loss program until you've consulted your doctor. On a 1,200-calorie diet, breakfast on each day of your six-week plan could consist of one serving of a high-carbohydrate food, one serving of fruit, one serving of dairy and one of a heart-healthy fat. 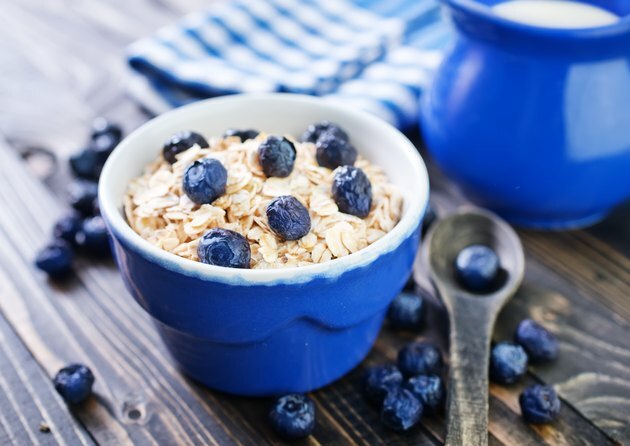 A glass of low- or nonfat cow's or plant milk and 1/2 cup of oatmeal prepared with water and topped with fresh or frozen fruit, such as blueberries, and an ounce of toasted nuts would fit these criteria. Alternatively, you could eliminate the fat serving at breakfast and have 1/2 cup of a low-sugar, high-fiber cereal, fruit and milk, or whole-wheat toast, nonfat yogurt and fruit. Plan lunches on a six-week, 1,200-calorie diet to include two servings of a lean protein and one serving each of carbohydrates, fruit, vegetables and fat. An example could be half a whole-wheat sandwich containing sliced turkey meat paired with a cup of fresh fruit cubes or slices and a leafy green salad tossed with 1 cup of chopped raw vegetables like tomatoes and 2 tablespoons of low-fat dressing. If you prefer, skip the fruit serving and increase the lunchtime carbohydrates to two servings. A cup of bean soup, tuna fish mixed with reduced-fat mayonnaise and tucked into half a whole-grain pita and 1 cup of raw vegetable sticks fit this lunch plan. Organize your dinners to include two servings each of carbohydrates, protein, vegetables and fat along with one serving of fruit for dessert, or three servings of protein and two each of carbohydrates, vegetables and fat. For the first menu option, try 2 ounces of broiled lean steak, a whole-grain roll, 1 cup of steamed vegetables like green beans topped with toasted nuts, 1/2 cup of cooked corn and chunks of fresh fruit like pineapple. A 3-ounce serving of grilled skinless chicken or tofu, 2/3 cup of brown rice, 1 cup of spinach sauteed with a few teaspoons of olive oil and a salad with fat-free dressing could fulfill the second menu option requirements. Include at least one snack per day during your six weeks on a 1,200-calorie diet. They'll help you get enough calories and nutrients while staving off hunger and cravings for less nutritious foods. Choose fruit -- whole fruit with the peel included, such as a whole apple, provides fiber that can keep you feeling fuller longer -- low- or nonfat dairy products like yogurt or cottage cheese, air-popped popcorn with no added oil or butter, pretzels or whole-grain crackers. To satisfy a sweet tooth, have sugar-free hot cocoa prepared with water.